A plant-based diet with plenty of variety is what we need to have healthy gut bugs. Research suggests we need plenty of fibre and at least 30 different varieties of plant per week. As promised here are the results of my plant based diet challenge. Did you beat me? Post on Eating Mindset via Facebook or Instagram and let me know. 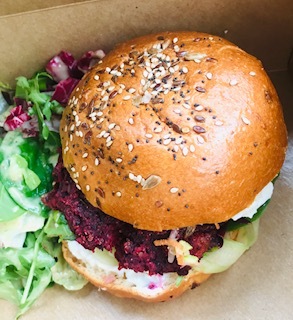 Thanks to @Flourishbakery for this delicious beetroot and grain burger. It got me through a late kick off football mum crisis. Everyone else was eating chocolate bars and chips. Granted they still got some plants but I got great taste, lots of colour and loads of nutrients. So whether you took the challenge or not I hope you got to see that a plant based diet can be delicious and appetising and easy to achieve. I enjoy meat and fish too but filling my plate with plants first is the way to go. 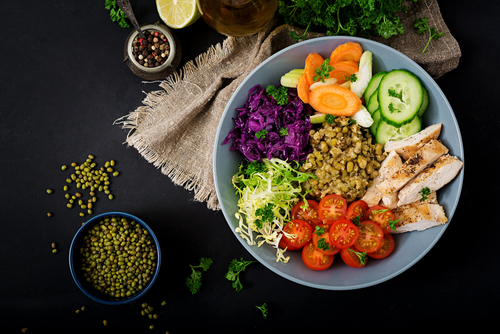 This entry was posted in Balanced diet and tagged gut health, microbiota, plant-based diet by Stephanie.fade. Bookmark the permalink.